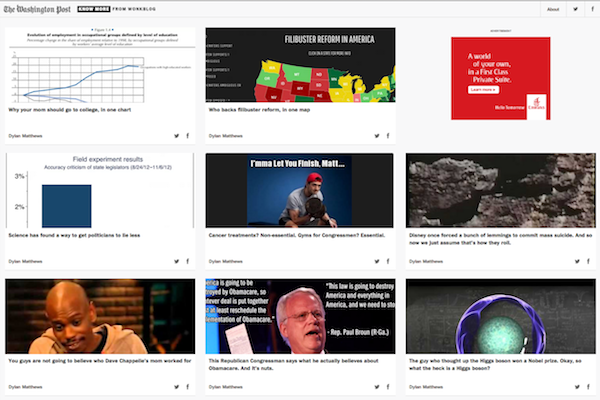 Eight to 10 times a day, Klein and reporter/Know More point man Dylan Matthews will post an image macro, video, tweet, data visualization, or block of text on a WordPress microsite built by Yuri Victor, user experience director at the Post. The pun is credited to Joey Marburger, the Post’s director of digital products and design. Beyond being tongue-in-cheek, it has a lot to do with how Klein and his team wanted the site to function: Readers are only meant to stay on the site briefly before charging off to pursue whatever interest was hopefully sparked by Know More’s catchy title and eye-catching post — whether that’s a Post story or something else. But don’t call it click-bait. Both Klein and Matthews have a lot of respect for the work BuzzFeed does, and feel the site, along with Upworthy, doesn’t get enough credit for the quality of its packaging. “It really irks me when people act like they’re better than BuzzFeed, which is an extremely effective journalism outfit — much better than most at being honestly what people are looking for,” says Matthews, who will create most of the content for Know More. After the Monday announcement, Gawker editor John Cook tweeted a subtle“look how far we’ve come” jab, linking to a Know More post and to a 2009 piece by Washington Post reporter Ian Shapira arguing that Gawker and its aggregating, link-baiting ilk were going to be the death of journalism. (Gawker had aggregated one of Shapira’s stories in a way he didn’t like; we wrote about it at the time. As it turned out, Gawker had been pitched the story by WaPo PR.) The aggregated had become the aggregator, Cook was implying. So if Know More feels like a BuzzFeed or Upworthy — “Why your mom should to college in one chart,” “The best song ever about a Target store” — that’s not an accident. That’s how it’s mean to feel — intriguing, intuitive, and ultimately, essential. But of course, Know More’s target audience is a bit nerdier than BuzzFeed’s — it’s for people who look up key dates of World War I just to know it, for people who blow through a weekend reading Wikipedia articles without showering. The question is whether Klein and his team can use the tricks of the former to serve the needs of the latter. Both Matthews and Klein said that writing the headlines and picking which parts of stories to surface is a collaboration that takes a lot of time and effort. Of course, BuzzFeed itself is known for using science to narrow down what makes something shareable. Klein says the internally built Know More platform will allow him full access to the analytics, which he’s eager to dive into. Of all the questions he hopes to explore, Klein said he’s most interested in finding out, “How do we activate…that sort of joyous curiosity that exists in these wonderful ways on the Internet?” Like Upworthy, Klein wants to take what BuzzFeed seems to have mastered and use it to promote a specific type of content to its corresponding audience, with virality being the ultimate goal. “If I could get people to read great stories by naming them all “1 Weird Trick to Lose Weight,” I’d do it,” says Klein. But there are a few things about the new project that sets it apart from its viral peers. “I think BuzzFeed and Upworthy do super cool things. I read them and I learn a lot from them,” Klein says. “This is a different kind of project. This is an effort to get people to interact more not with the social web but with the slow web.” It’s meme-as-pointer, not meme-for-meme’s-sake. With Know More, he wants to take the lessons of the social web and apply them to the kind of wonky reporting he and his team are known for. Ultimately, Know More is an experiment to help understand the desires of its audience. If more people read Wonkblog content along the way, fine. If the Post makes some money in the process, great. If your weird aunt or former roommate ends up posting a Know More link to Facebook, even better. But in the end, the project has two hallmarks of useful experimentation: It builds on a preexisting success, and the stakes are low. You won’t believe which media company just launched a BuzzFeed-inspired microsite » Nieman Journalism Lab.